After August's spectacular improvement in job approval polling, Barack Obama saw his numbers fall in September -- what the stock market might call a "correction." Obama had the best August he's ever had in terms of improving his poll numbers, but it seems now that the whole month was the high end of a slow, two-month cycle which might indicate he's hitting a plateau. That's all a very polite way of saying Obama's numbers went down in September, although not as much as they had risen in August. Let's take a look at his new chart. Obama's average monthly job approval rating rose 1.7 points in August, but then fell back 0.8 points in September, to wind up at 50.5 percent. His disapproval number fared even worse -- after falling 1.8 points in August, it rose 1.5 points in September to close at 46.4 percent. So while Obama's losses were fairly large for a single month, in perspective they are really nothing more than the end of a bounce. September's political news almost exclusively centered around the presidential race between Donald Trump and Hillary Clinton, of course. The back-and-forth between the two has reached epic levels, culminating in the first presidential debate at the end of the month. Trump looked like he was closing the polling gap with Hillary for a while there, but after his laughable debate performance, Hillary has roared back (one national poll just put her up by 10 points). Heading into the final month, Clinton has the edge, although things are still close enough that they could shift back again quickly. Obama wasn't in the news much at all last month, even though he had his first veto overridden by Congress. The whole thing was somewhat of a fiasco -- for Congress, that is. They passed a bill over Obama's veto and then tried to blame Obama for how badly the bill was written. No, really! They're even now promising to return after the election and fix the bill to address Obama's concerns (the reasons why he vetoed it in the first place). That doesn't exactly count as a political loss for Obama, to put it mildly, it just shows how incompetent the Republicans running both houses of Capitol Hill truly are. But, in the end, the public wasn't even paying much attention, what with all the campaign news flooding the airwaves. This dynamic will continue throughout October, barring any unforeseen events (or should I say "surprises"?). Obama will be in the background of the political news, as the election fever hits its highest pitch. We've got two more debates to go, and then the homestretch of campaigning before the election (finally!) happens. My guess is that most of this won't even affect Obama's job approval polling much, if at all. Which is why I'm thinking the graph is going to flatten out somewhat over the next two months. But I'm getting ahead of myself, here. What essentially happened in September is that Obama's post-convention bounce wore off to a certain degree. 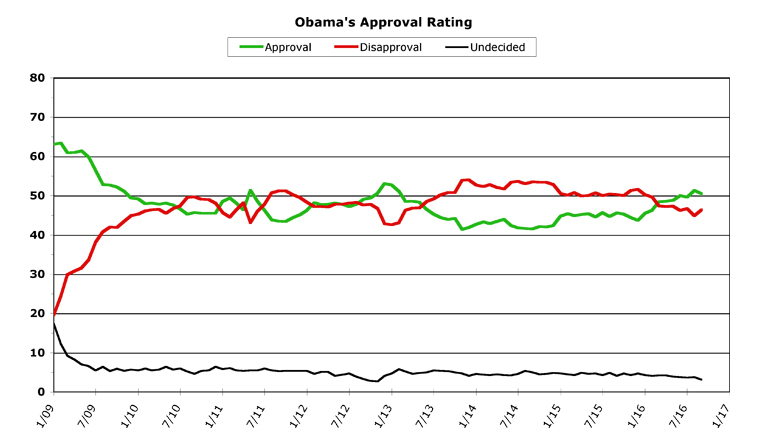 Throughout August, Obama rode this bounce, but then it fell back a bit in September. 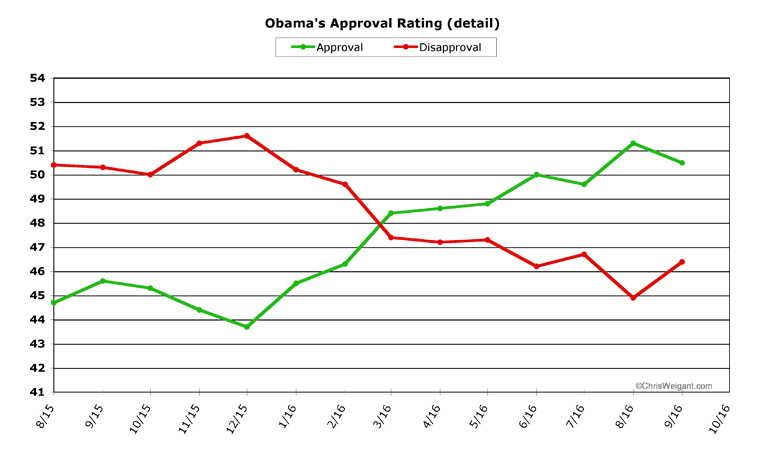 Let's take a detailed look at the past year for Obama, where the differences are more easily seen. 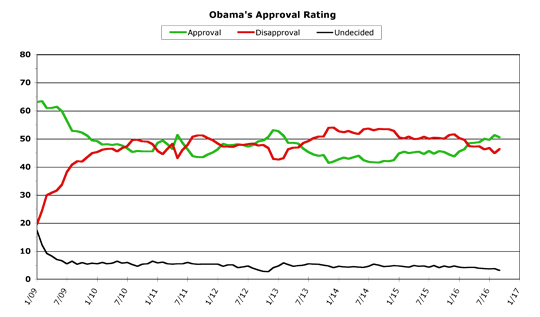 For the past four months, the trend for Obama's approval seems to be two steps forward, one step back. A large gain is made, but then it is tempered by a smaller loss the next month. The overall trend goes up, but in fits and starts. There were two interesting bits of data last month worth mentioning, before I get to the overall trend. 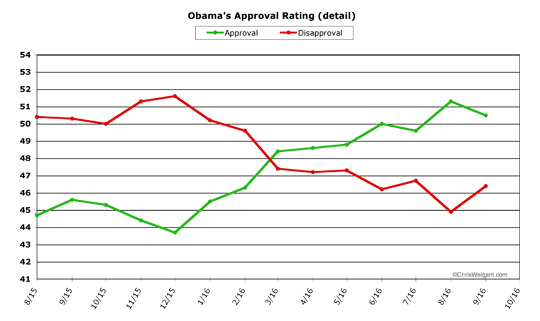 The first is that Obama's approval rating did better than his disapproval rating. After rising 1.7 points in August, Obama's approval fell only 0.8 percent last month -- less than half of the gain he had just made. But his disapproval rating didn't follow this pattern, first falling 1.8 points but then rising back 1.5 points last month -- almost as big a gain as the previous month's fall. This brings up the second interesting bit of data. In the larger graph at the top of the column, there is a third line: undecided. The undecided number usually fluctuates from around 4.0 to 6.0 percent. The past five months, however, it has been below 4.0 percent, and it hit a low of 3.1 percent last month. This is the lowest it has been for Obama's entire second term. What happens is that the public pays more attention around the election, which means fewer people don't have an opinion. Obama's undecided number is now lower than it has been for his entire presidency, except for two months: October (2.8 percent) and November (2.7 percent) of 2012. So in large part the difference between the changes in Obama's approval and disapproval are due to more people paying attention, as they always do just before an election. At the end of last month's column, I predicted Obama's numbers might plateau for a few months, and I still tend to believe this might be the larger trend here. Technically, I am not supposed to know what will happen in October when I write September's column, but we're already almost a week in -- and Obama's job approval ratings are once again rising quickly. But -- at least until the election's over -- I think there's a built-in ceiling to this rise. I think Obama's approval numbers will hover in the range between 50 and 52 percent, and his disapproval will likewise keep within the range of 45 to 47 percent. Barack Obama's overall job approval chart, for both terms, has shown long periods of plateaus, interspersed with periods of frantic (or not-so-frantic) movement. He's had more big flat spots on his graph than peaks or valleys, to put this another way. I think the next two months will bear this out, and Obama will say above 50 percent (but not much above it) until the election's over. At that point, traditionally, lame-duck presidential ratings usually spike upwards, since everyone's thinking about the new president and is more willing to give the outgoing president the benefit of the doubt. So Obama could finish his second term with job approval as high as 55 or even 60 percent (indeed, he's at or above 55 percent in some individual polls already). Congress is already out on the campaign trail themselves, so no big legislative crises loom for Obama. He'll be campaigning for Hillary, and he'll quite likely be in the news for the coming week, supervising disaster relief from the incoming hurricane. This did him wonders in 2012 with the Sandy storm, but he's also not on the ballot this time around, so people will be paying less attention. My prediction is that Obama's job approval will bounce back in October, continuing the last few months' fluctuation pattern. At the same time, I'd be surprised if his job approval average topped 52 percent. Still, this bodes well for Clinton, since presidents with good approval ratings usually see their party retain the White House in November. It also bears mentioning that if Obama does plateau at roughly 51 percent approval, it will be the highest plateau he will have ever achieved during his entire term in office (ignoring the "honeymoon" period during his first year, that is). One final note to close on, for regular readers. While preparing this month's charts, it really struck home how few months Obama has left in his term. There will only be four more Obama Poll Watch columns, to put this another way. When I started this series, the graphs had very little data and a whole lot of white space on the right side. The empty spaces are almost full, though, meaning the column series is almost at its end. So I'd just like to take a minute to thank everyone for continuing to poll-watch with me, because it certainly has been an interesting ride. Stay safe for the next few days. I'm sure I speak for everyone here when I say we truly want to see you blown away by Hillary Clinton's victory in a month, and not by mere hurricane winds! "Two riders were approaching, and the wind began to howl." "If it keeps on rainin', the levee's gonna break..."
Let us know you're alright as soon as you can!!! I heard Obama is sitting at 55% right now. Speaking from my own experience when Hermine came through my area of Florida, don't be too worried if we don't hear from Michale for about a week. Power outages can last a long time. It doesn't mean anything else is wrong. From one Florida hurricane survivor to another, stay safe and good luck Michale! Any chance we'll see him in Putin territory before next January? I doubt that he'll be invited anytime soon. heh. Seriously, I think Obama will leave office with quite good approval numbers, but that they will only improve with time (especially among Republicans). I picture Madam Tussaud's in the year 2030 having a display that includes the Clintons, the Obama's, and the two Bushes. The juxtaposition between the two dynastic families, the first black and (possibly) the first female president all interacting in the same political time and place will, I'm sure, be too much for historians to resist, and I expect lots of keystrokes to be spent analyzing the whole spectrum of the era 1992-2024, and its peculiar mix of cultural shift, partisan tribalism, shifting international terrain, and economic challenge. Trump's ascension to the nomination will be studied in relation to all of those, and the yet-unknown effect of his candidacy will have its own chapters in a whole shelf full of books, whether he wins or loses the election. So, as for Obama's approval ratings after he leaves office: I think we can safely assume that his numbers will rise (just as Carter's did, after all) and his role as the nation's first black president will certainly be celebrated, especially so in the black community. Someday Republicans will quote him, you can bet on it. Are you trying to be funny, Balthasar? Trying. With Michale away and hunkered down, there's no one to jump on the bad jokes, so that I won't put my foot in my mouth. 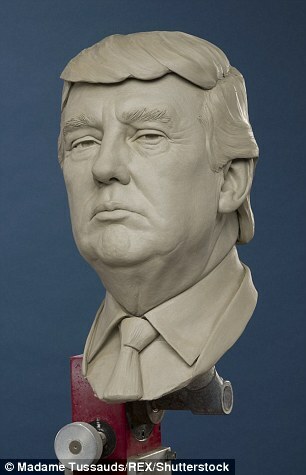 I will say, though, that I never saw a wax figure that looked as much like the person depicted as that sculpture I linked to in  does. You are in our prayers! Stay safe. Someday Republicans will quote him, you can bet on it. "Someday Republican will misquote him..."
They will, but it won't be until they call themselves "Democrats" again. Kinda like how they love to claim to be "the Party of Lincoln" today. Hey I understand that Trump is about to release an "Apology" video in response to the video of him joking crudely with the cast of Inside Edition was released. It's been released unedited, so you can get the full effect of it. The media is on this like mosquitoes on tourists. This remark is time stamped. I predict that Trump will do a cursory semi-apology tonight and then unload on Clinton tomorrow. Remember when he went after her early in the primary for being an 'enabler'? That he accused her of abetting Bill in his extra-presidential dalliances, yadda, yadda, yadda? Buckle up. Bill's about to defend his first wife. Correction: the video was shot by NBC's Access Hollywood. Just as I thought: a few sentences of apology, would have sounded sincere if he wasn't obviously reading it, then a statement of justification: the video is a decade old. Then a denial that he was even on the video, i.e., the 'that isn't me, anyone will tell you' defense. Then a pivot to an attack on Clinton, which he promises we'll hear more about. My question is: if the Trump video is, according to Trump, moot because it's an old video, what does that make the Lewinsky Scandal, which is even older? If I'm Hillary, I say Sunday night, "Those things played out in public a long time ago, Donald, and we spent a very difficult time afterward rebuilding trust in our marriage because we love each other. That is clearly not a concept that you've ever been familiar with."